Hello Kitty Launcher is Back! !For those fans who used to download this app or purchase in-appcontent, you can now use your downloaded content with Hello KittyLauncher. We are sorry for any inconvenience caused by previouslaunched of Hello Kitty Icon Home. Now we bring back “Hello KittyLauncher” again and we have Hello Kitty Icon Home as anotherapplication for those who like to customize your icons with cuteHello Kitty and Sanrio characters.Hello Kitty Launcher is a brand-new Android 2.1-based homereplacement app which is compatible with new features of Android2.1 and higher. It features faster and smoother running, therichest theme resources, the most useful multi-screen/Dockbarextensions and unique customization options, to bring you arefreshing user experience on smartphones.Tips:1. Hello Kitty Launcher is a totally free app without any charge.We need directly call phone number permission to enable the dialshortcut on Home screen.2. Click "More Themes" to download more themes for Hello KittyLauncher.3. Click "Wallpapers" for set your new wallpaper.4. Click "Setting" for customize scrolling orientation / Set thenumber of screen / Set Default of screen.Hello Kitty Launcher will make your display looks so cool!Downlad Free!!! Hello Kitty Icon HomeIt’s FREE!! Download Now and GET FREE Hello Kitty and SanrioWallpapers! !Hello Kitty Icon Home is an all-in- one application for HelloKitty Lovers.With this app you can download and customize your favorite HelloKitty icons on your home screen. 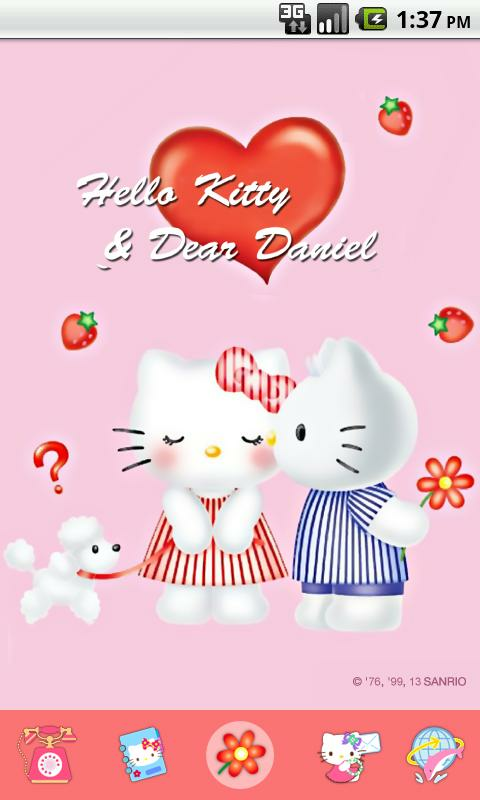 Download stickers, wallpapers andthemes of Hello Kitty and other famous Sanrio characters. Send orshare Hello Kitty stickers with your friends via Line, Facebook orMessage.A MUST HAVE APPLICATION FOR ALL HELLO KITTY FANS! !Let’s see what you can find in this COOL application.- Cutie iconsFind a variety of super cute icons from Hello Kitty, My Melody, BadBadtz Maru and so much more from famous Sanrio characters.- StickersDownload or share adorable stickers of Hello Kitty and Sanriofriends with your friends, your loved ones or family.- WallpapersDownload and set Hello Kitty wallpaper or other Sanrio wallpaper asa lock screen , home screen or both.- ThemesDownload and choose your favorite Hello Kitty theme for yourmobile.How to use Hello Kitty Icon HomeIn home tab, you will find list of Sanrio cartoon characters onthe top of the page.You can select the cartoon character you want or choose by 4categories as follows.Theme: Download your favorite Sanrio themes from Theme tab andset as a theme for your mobile.Icon: There are 32 cartoon’s icons in each set of icon. You canselect and customize those icons on your home screen.Wallpaper: Download and set wallpaper you want for your Homescreen, lock screen or both.Sticker: There are 9 stickers in each set of sticker. You candownload, save or share stickers with your friends via Facebook,Line, Message, etc.In each category, you can press a heart symbol (to save yourfavorite content as a Like) or purchase that particularcontent.How to set iconsAfter purchasing, it will let you select icons. You can tab toassign each icon with the app you want. ** Please note that these icons are only shortcuts on yourscreen. You cannot uninstall your app by deleting Sanrioshortcut.You need to uninstall by selecting from the original appicon. Hello Kitty Pink Heart Theme .Love Hello Kitty . Hello Kitty Fans don't miss .We have theme for you . Hello Kitty for Valentine ThemeLove Hello Kitty . Hello Kitty Fans don't miss .We have theme for you . Keroppi loves adventure, and his bubblypersonality makes him popular around Donut Pond. He has a brothercalled Koroppi and a sister called Pikki. Keroppi is a fantasticswimmer and singer (but not at the same time! )Love Kero Kero Keroppi . Kero Kero Keroppi Fans don't miss.We have theme for you . Love Hello Kitty . Hello Kitty Fans don't miss.We have theme for you . New arrival!!! An Animated "Hello Kitty"Screen Lock is here! !The latest version of Screen Lock that let you see animatedbackground with an adorable "Hello Kitty" on the screen.A must have Screen Lock for all "Hello Kitty" fans.Give it a try Now! !How to use Hello Kitty Animated Lock?- After downloading your prefer Hello Kitty Animated Lock,please install Hello Kitty Animated Lock program for the firsttime.If you used to download Hello Kitty Screen Lock earlier, you candownload the new "Hello Kitty Animated Lock" without installing aprogram.- In settings menu, choose enable screen lock- Setup your screen lock- Choose separate wallpaper for your screen lock and home screenor set same wallpaper for both.- Set 24 or 12 Hour time- Share this great app with your friends and family- Buy or download more "Hello Kitty" contents such as ScreenLock, Theme, Wallpaper and Sticker in Store tab.Features:- The cutest Animated Screen Lock with ìHello Kittyî, the mostfamous Sanrio cartoon character- Find your downloaded Hello Kitty screen locks in yourcatalogue- Display current date and time- Easily unlock your phone with a single swipe- User can set separate wallpaper for lock screen and homescreen- Store tab: the place where you can find lots of Hello KittyContent. Get free contents or buy your prefer contents rightaway.Enjoy new “Hello Kitty Animated Lock” and get more AnimatedHello Kitty screens from Store tab. HELLO KITTY Theme offers Android users to easily beautify yourscreen with HELLO KITTY lovely wallpapers, icons, drawer, and othercustomize parts.Unauthorized reproduction of the illustrations andimages used in this application is strictly prohibited.Allillustrations and images are the copyright of SANRIO CO., LTD. This theme includes 20+ wallpapers and custom icons. Icon aremasked.Please visit my tumblr for free matching goodies. If need of morecustom icons, please email me with icon names.Enjoy..
“I love kitty” is a theme application appliedto Wali SMS. Do you like the cute and fashion pink Kitty? Come andcollect it!1. Please ensure your mobile phone has been installed with WaliSMS master app prior to installing this theme application. (Android Market download link:https://market.android.com/details?id=cn.com.wali.walisms or pleasesearch in Google Android Market for “Wali SMS” to download.)2. Application of the theme: download and install the theme of“I Love Kitty” for Wali SMS, enter Wali SMS– Menu – Skin – Select,and click on it to apply the installed theme of “I Love Kitty”. Love Hello Kitty . Hello Kitty Fans don't miss .We have theme foryou . HELLO KITTY Theme offers Android users to easily beautify yourscreen with HELLO KITTY's lovely wallpapers, icons, drawer, andother customize parts.Unauthorized reproduction of theillustrations and images used in this application is strictlyprohibited.All illustrations and images are the copyright of SANRIOCO., LTD. This theme is to be used with GoLauncher.Theme includes Hello Kitty walls and over25+ icons.Do enjoy !!! Hello Kitty Chic ThemeLove Hello Kitty . Hello Kitty Fans don't miss .We have theme for you .